The next page-turner in the award-winning Joanna Stafford series takes place in the heart of the Tudor court, as she risks everything to defy the most powerful men of her era. Henry VIII's Palace of Whitehall is the last place on earth Joanna Stafford wants to be. But a summons from the king cannot be refused. After her priory was destroyed, Joanna, a young Dominican novice, vowed to live a quiet life, weaving tapestries and shunning dangerous conspiracies. That all changes when the king takes an interest in her tapestry talent. With a ruthless monarch tiring of his fourth wife and amoral noblemen driven by hidden agendas, Joanna becomes entangled in Tudor court politics. Her close friend, Catherine Howard. is rumored to be the king's mistress, and Joanna is determined to protect her from becoming the king's next wife—and victim. All the while, Joanna tries to understand her feelings for the two men in her life: the constable who tried to save her and the friar she can't forget. In a world of royal banquets, jousts, sea voyages and Tower Hill executions, Joanna must finally choose her future: nun or wife, spy or subject, rebel or courtier. 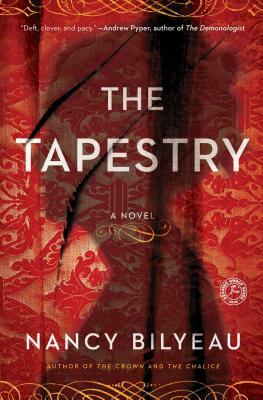 The Tapestry is the final book in a Tudor trilogy that began in 2012 with The Crown, an Oprah magazine pick. Don't miss the adventures of one of the most unforgettable heroines in historical fiction. Nancy Bilyeau, author of The Crown and The Chalice, is a writer and magazine editor who has worked on the staffs of InStyle, Rolling Stone, Entertainment Weekly, and Good Housekeeping. She is currently the executive editor of Du Jour magazine. A native of the Midwest, she lives in New York City with her husband and two children. Visit her website at NancyBilyeau.com. "A rip-roaring Tudor adventure from Nancy Bilyeau! Novice nun turned tapestry weaver Joanna Stafford returns to the court of Henry VIII. She's that great rarity of historical fiction: a fiercely independent woman who is still firmly of her time. A mystery as richly woven as any of Joanna's tapestries." "The Tapestry takes its history seriously, but that doesn't stop it from being a supremely deft, clever and pacy entertainment. This is Nancy Bilyeau's most thrilling - and enlightening - novel in the Joanna Stafford series yet." "A master of atmosphere, Nancy Bilyeau imbues her novel with the sense of dread and oppression lurking behind the royal glamour; in her descriptions and characterizations . . . Bilyeau breathes life into history." "In The Tapestry, Nancy Bilyeau brilliantly captures both the white-hot religious passions and the brutal politics of Tudor England. It is a rare book that does both so well." "Bilyeau sends her plucky former novice back into the intrigue-laden court of Henry VIII." "[A] layered book of historical suspense." "Bilyeau paints a moving portrait of Catholicism during the Reformation and of reclusive, spiritual people adjusting to the world outside the cloister. This intriguing and suspenseful historical novel pairs well with C. J. Sansom’s Dissolution (2003) and has the insightful feminine perspective of Brenda Rickman Vantrease’s The Heretic’s Wife (2010)." "A compelling and pacey time machine to the sixteenth century." "A gripping, tightly plotted mystery, with a beguiling heroine at its heart, that vividly conjures up the ambiguity and danger of Reformation England. Bilyeau's deftness of touch and complete control over her complex material make for a truly exciting and compelling read." "An exciting and satisfying novel of historical suspense that cements Nancy Bilyeau as one of the genre's rising stars. The indominable Joanna Stafford is back with a cast of powerful and fascinating characters and a memorable story that is gripping while you are reading and haunting after you are done. Bravo! The Chalice is a fabulous read." "The Chalice offers a fresh, dynamic look into Tudor England's most powerful, volatile personalities: Henry VIII, the Duke of Norfolk, Stephen Gardiner, and Bloody Mary Tudor. Heroine and former nun Joanna Stafford is beautiful, bold and in lethal danger. Bilyeau writes compellingly of people and places that demand your attention and don't let you go even after the last exciting page." "Nancy Bilyeau’s The Tapestry continues her excellent incursion into the turbulent and high-stakes world of the Tudor Reformation in England. It was a time when principle and faith had to do battle with arbitrary power and personal fear to keep surviving. The narrative voice draws us into the story from the first page and drives us forward to the end.What is most striking about the book is how it cleverly intertwines the history and political intrigue in the court of Henry VIII with an account of an intensely personal drama and romance. A vivid story, well and clearly told, which will be enjoyable for a wide variety of readers."